Summer is a busy time at Sparkbox. 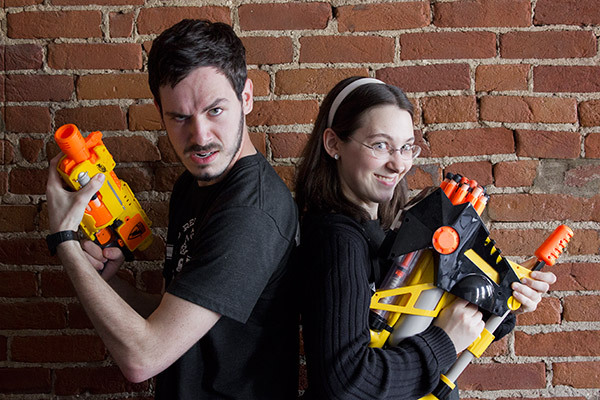 We’ve brought on two interns — Linnie Jupe and Ethan Muller — to soak up some code and the hot Ohio sun. After some training in the art of nerf warfare, they’ve gotten along just fine. Get to know them a bit, so you can say you knew them before they changed the world of web design. I’m a born and bred Californian. Anything below 70 degrees is sweater weather, and I have never had a snow day. California Pizza Kitchen is the absolute best pizza ever — fight me on that. So, of course, I decided to go to college in the cornfields of Ohio. This December I’ll be graduating from Cedarville University with a degree in Graphic Design and minors in Bible, Art, Technical Writing, and Web Design. The multitudinous minors just kind of happened, because I am very Interested in just about everything. I got my start in design and HTML in high school, when I discovered Neopets petpages and went bonkers with my shiny new Adobe Creative Suite 1. I wrote completely unsemantic markup and created appalling graphics and composed dumb midi files and set them to autoplay and loop forever. It was a dark time in my life. College and Sparkbox have purged most of my bad habits, and they have taught me more than I can fit in my head at one time. That’s why I’m so glad to be interning at Sparkbox for the summer — it’s my hope that repeated exposure to consistent awesome will leech into my brain through osmosis. And there is a lot of awesome around Sparkbox. Backwards, my name is Rellum Nahte. I’m into the web, design, music, and video games. I got my start with graphics at five years old. I spent a good deal of my childhood in MS Paint drawing goofy scenes and characters. I started web development seven years later when I learned HTML and CSS for the reason any reasonable twelve-year-old would — I wanted a decked-out Neopets page. My coding/design chops have improved a little since those days. A little. I was homeschooled up to high school, when I began to attend a career center for interactive media. After that, I went to college at the School of Advertising Art in Kettering, OH. I’ve now graduated. Time flies. This post has not been sponsored by Neopets. Unbeknownst to our office of middle-aged geeks, Neopets is evidently single-handedly responsible for training the next generation of web developers. Who knew?